Treadmill Fitness Walking is an effective way to burn extra calories and achieve a healthy lifestyle. Walking or light jogging on the Sunny Health & Fitness SF-T7615 Cross Training Magnetic Treadmill is one of the easiest and most effective ways to achieve your fitness goals. Fitness walking can help you lose body fat, tone muscles and is a great way to stay in shape. BELT RESISTANCE: This manual trainer gives you a wider and longer tread belt (41.7L x 13.4W in.) The magnetic tension helps stabilize the speed of the belt and enable you to walk at selected belt tension settings. SMOOTH AND QUIET: Twin 6" diameter flywheels provide a smoother and more consistent workout. SPACE SAVING DESIGN: This treadmill has been tested up to 220 lbs user weight capacity allowing you to walk your way to fitness. Can be folded and moved easily with included transportation wheels. 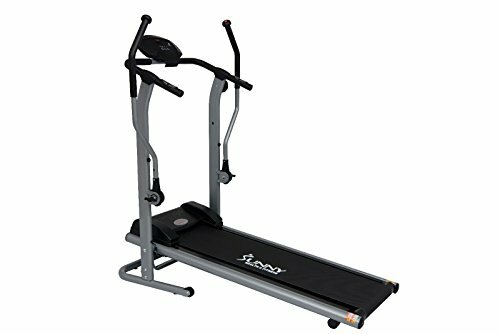 COMFORTABILITY: Unlike most of other manual walkers, this treadmill is at a low incline which prevents strain on ankles and leg muscles. Non-Slip padded handrails add comfort and safety to your workout. GET RESULTS! : Add the full motion upper body adjustable resistance arms and work the muscles of your arms and shoulders. Multi-Function LCD monitor displays time, distance, speed, calories and scan.